The Great Smoky Mountains always looked dull black and tawny to Lauren Van Lew from the 3,590-foot-high perch of Mt. Harrison. That was true even when the rugged expanses were bursting with their famous fall colors. The 20-year-old Van Lew has been colorblind her whole life. Some colors have just been left to the imagination. She loves painting, but her wife Molly has to help her pick and mix colors. Last week Van Lew visited the scenic mountaintop again. She looked through a special viewfinder. For the first time she saw yellows. She saw oranges and she saw reds. They were exploding across the landscape. "Red was the biggest difference. I mean, I can't describe it," said Van Lew. She lives in Sevierville, Tennessee. "It's the most beautiful thing I've ever seen in my life. That red, it's just gorgeous. It's incredible." A colorblind viewfinder was installed atop the Ober Gatlinburg resort. It was installed by the Tennessee Department of Tourist Development. It is one of three in the state that debuted last Wednesday. It lets people gaze upon colors that they may have never seen before. The other two viewfinders are at scenic areas of Big South Fork National River and Recreation Area near Oneida. The other is at the westbound Interstate 26 overlook near Erwin in Unicoi County. The technology isn't new, it consists of eyeglasses that let colorblind people see colors. But state officials believe this is the first time it's been incorporated into a viewfinder. They cost $2,000 apiece. They help people with red-green color deficiencies. How crisply the viewfinders display new colors can vary from person to person among the 13 million or so people in the country with color deficiencies. State tourism officials invited people to try it out last Thursday at Ober Gatlinburg. They brought them up by ski-lift, but left the details somewhat vague. They wanted to maintain the element of surprise. A crew filmed their reactions for marketing material. Their first glimpses drew tears, smiles and faces stunned by wonder and awe. "My heart just started beating fast," said Todd Heil, who generally sees a lot of green. "I felt like crying, man. Too many people around." 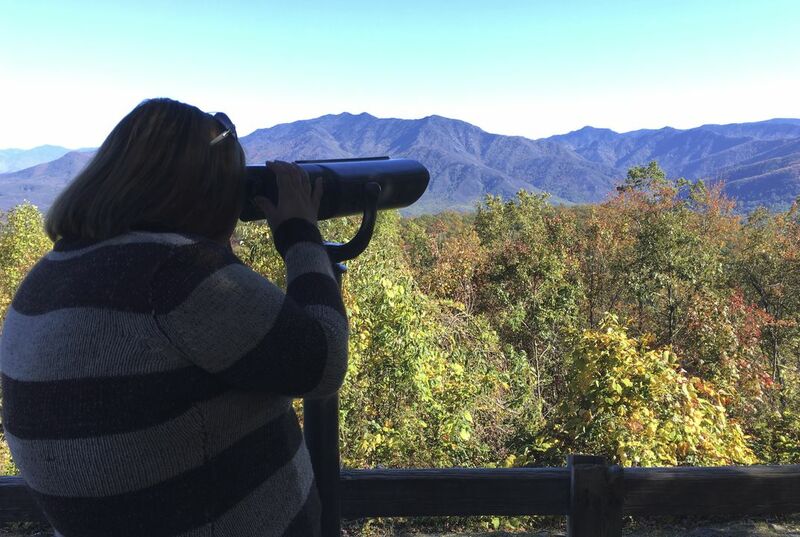 Amber McCarter works in real estate, so part of her pitch is the fall foliage that drapes the Great Smoky Mountains, even though she can't entirely see it herself. The viewfinder gave her a firsthand look of the views she's been selling. One can see the true vibrance of the autumn hues that doecorate the landscape through viewfinder. It's quite beautiful. The view finders helps them see green-red colors. Leaves are typically green in the spring/summer and red in the fall. I think the leaves were a good subject for the viewfinder because in the fall they come in so many variations of bright colors. I think the whole concept of the viewfinder is very unique and shows how technologically advance we are becoming. 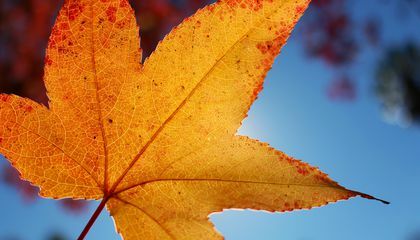 Leaves are a good view finder because it's different colors in the fall and it helps people with colorblindness. The colors red and yellow are the actual colors that people don't see. Some people enjoy the colors. It's like an art show to people. i really like that ideal it seems cool and neat ???????? Wow! I never knew that there actually a "half of a cure" for color blindness! It is so cool!bI wonder how they did it. If I were colorblind I would hug the people so hard they couldn't breathe! I would be so happy and I hope the people who are actually colorblind will feel the same way! Because it is a very good creation! Well, Autumn is the only season that bring the exuberance that is the changing of the leaves and I think that in the Smoky mountains that is important because of all of the trees that inhabit that land, really give colorblind people a chance to experience a natural array of colors just as a sunset would. Even though a lot of people have color deficiencies, we do not take into consideration of how those people see the world and it makes me happy to see how some organizations think about those people and create an item that could impact them. because it can change colors it can be a project to.